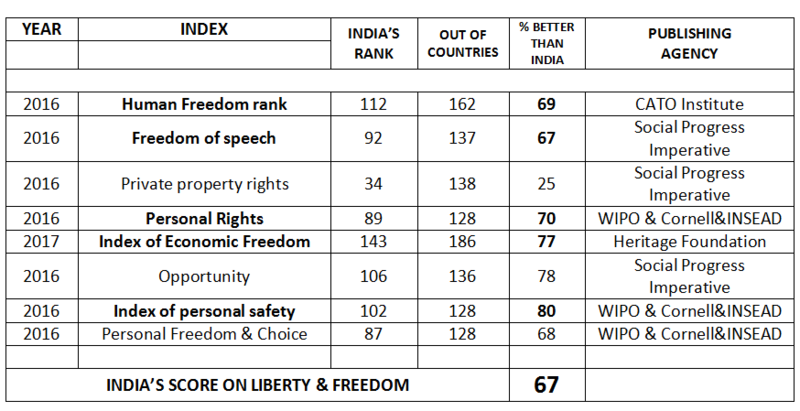 How does India stack up against other countries on attributes like economic freedom, ease of doing business, corruption, educational opportunities, environmental sensitivity, liberty, individual rights, and happiness etc.? Comparison of countries across a whole host of attributes has now become easier. There are about 170 global indices that provide easily understandable quantitative ratings of government activities and policies. These ratings have become an important tool for governments, voters, NGOs, civil liberty advocates, and policy makers. Country rankings, however, need to be interpreted with caution. Rankings are ordinal numbers ( 1st, 2nd, 3rd, etc.) and unlike cardinal numbers ( 1,2,3 ) they only show the relative difference between two rankings. A nation ranked 30th is better than another ranked 60th but not twice as good. Also, a country’s rank may sometimes improve not because of anything good it is doing but because of a relative deterioration in other countries. An example of this is the Ease of Doing Business Index in which India’s rank has fluctuated up and down several times from 116 to 142 over the last ten years. This fluctuation is just statistical noise and does not reflect an underlying change. To examine where India stands relative to other countries I analyze sixty-one different global indices in which India is ranked on different indicators. These indicators are parsed into seven attributes and the rankings are normalized on a scale of 1 to 100, with 1 being the best and 100 the worst. So a normalized score of 25 would imply that twenty-five percent of the countries rank better than India on an attribute, and a score of 70 would mean that seventy percent of the countries are better than India. A lower score is, therefore, preferred because it shows better performance relative to other countries. So how does India compare with other countries? The results are quite surprising. Table 1 below shows India’s score for each of the seven attributes and the aggregate score for all sixty-one indices. It should be noted here that individual indices may suffer from have methodological problems and second-hand and unreliable raw numbers that are not comparable from country to country. Aggregating all sixty-one indices mitigates this bias. The aggregate score for India on all attributes is 64 which is quite poor. It suggests that sixty-four percent of the countries in the world are better than India on a combined range of social, economic freedom, quality of life, happiness and other indicators. The individual attribute score was worse than 50 for all but one attribute. This means that more than half the countries in the world are better than India on almost all counts. The best India did on any attribute India was a score of 48 for the strength of its institutions, driven in large part by the size and maturity of its stock market. This is a severe indictment of India’s governance. We can treat these facts like the ostrich and stick our head in the sand and pretend that all is well. But all is clearly not well. India is now seventy years removed from its independence yet it scores significantly worse than countries like Singapore, South Korea, Taiwan, Latvia, Poland, Estonia, Botswana, Romania and others that got their independence much later than India. It is time to stop blaming and to start introspecting on the direction in which this country is going. The Modi government needs to stop comparing its performance to the low standards of the Congress government and start measuring its performance against the rest of the world is making. In the end, it only matters how India does against the world and not how NDA’s India does against UPA’s India. The blame for India’s poor global standing rests squarely on its dismal governance. For seventy years Indian citizens have been victimized by large, obtrusive and corrupt governments that have enriched themselves and their cronies by regulating and manipulating social and business behavior. The Modi government appears to have done better than the previous government on the administrative front, but its encroachment upon individual liberty and economic freedom is frightening. It promised “ small government and big governance,” but its policies do not reflect any movement towards smaller government or freer markets or greater liberty for the people. Many readers of my newsletter have written to me suggesting that the changes we seek–limited government, free markets, and greater liberty– while truly transformational, will require time. That is just not correct. The vast majority of changes that would transform India don’t require legislative approval and can be implemented by the PM in short time using his executive powers. It requires political will and courage because these changes would hurt entrenched interests who profit handsomely from government control of processes, resources, and policy. Let’s now examine each attribute in detail to better understand reasons for India’s dismal overall performance. In each of the tables below ( Tables 2-8) I show the original ranking of India, the normalized rank, the year for which the ranking was done and the agency that prepared the rankings. India is one of the fastest growing economies in the world growing at an average of about 6.7% over the last twenty years. But percentages can be deceiving because India is coming off a low base. Unless systemic changes are also being made to improve the business climate this growth will likely taper off soon. Business needs a free unfettered environment to flourish. Regulations reduce economic freedom and make businesses less productive. Free markets have proven to be the most productive economic system by far of all available alternatives. Per capita income in countries with free markets is five times higher than in countries in which the government controls the economy ( Heritage Foundation, 2017). 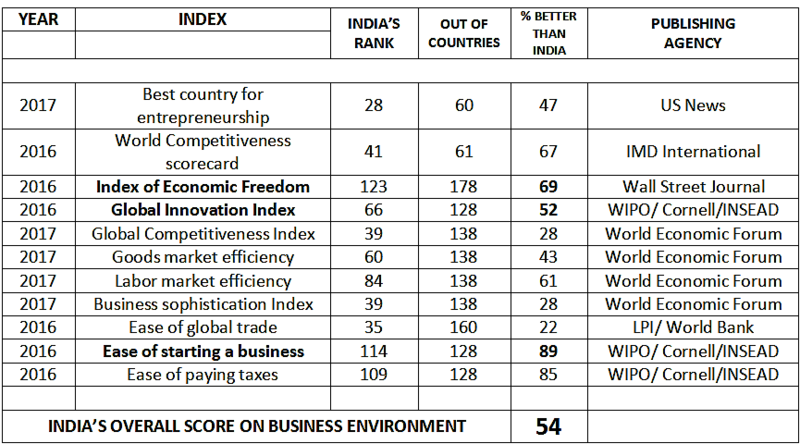 How does India score on economic freedom and ease of doing business? Table 2 below summarizes the results. India ranks relatively well on global trade and competitiveness and in business sophistication, but very poorly on ease of doing business and tax policy. It’s goods and labor markets are still extremely inefficient ( ranking around in the 50th percentile). Economic freedom is a major concern, and in the Wall Street Journal’s Index of Economic Freedom, India ranks a miserable 123rd out of 178 countries. This ranking puts India in the “mostly unfree” economies primarily because the government maintains an extensive presence in many areas through public sector enterprises. A restrictive and burdensome regulatory environment discourages risk-taking, innovation, and entrepreneurship. Corruption, underdeveloped infrastructure, and poor management of public finances also undermine overall development. India’s overall score on the business environment attribute is 54. This indicates that more than half the countries in the world have a more open business climate than India. This must change for India to become a global economy. The government must act immediately to eliminate the excessive regulatory burden on business. Mr. Modi could easily pass an executive order tomorrow to reduce regulations by 90%. Also, his government needs to simplify the tax code, reduce or eliminate the corporate tax, eliminate all retroactive taxation, and eliminate the tax terrorism his Finance Minister has unleashed on Indian business. Mr. Modi has been in power now for three years, yet there has been very little improvement in either economic freedom, innovation, ease of doing business or adoption of free market policies. These changes can be implemented almost immediately if there was the will. In their best-selling book “Why Nations Fail,” Daron Acemoglu and James A. Robinson argue that economic prosperity depends above all on a nation’s economic and political institutions. Countries with strong and “inclusive” institutions where many people have a say in political decision-making are more prosperous than countries with “ extractive” institutions where a small group of political and business elite control political and economic institutions and are unwilling to change. They argue that nations with extractive institutions don’t prosper because entrepreneurs and citizens have less incentive to invest and innovate. How does India rank on the institutional component? According to the World Economic Forum Index, India ranks 42nd out of 138 countries for the strength and inclusiveness of its institutions. India has well-developed and mature financial markets and ranks in the top 28% of countries on this indicator. But India is a very heavily regulated country run by a bureaucratic government and scores poorly (60) on the quality of its regulatory framework. India’s overall score for this component shows that 48% of the countries have better and more inclusive institutions than India. India must improve its regulatory quality, the judicial system, infrastructure, banking, and credit institutions and develop a strong commercial and municipal bond market. Also, the Securities Exchange Board (SEBI) should give serious consideration to proposals for a stock market for startups to unleash innovation and growth. A sound and a supportive macro environment is a prerequisite for economic growth. 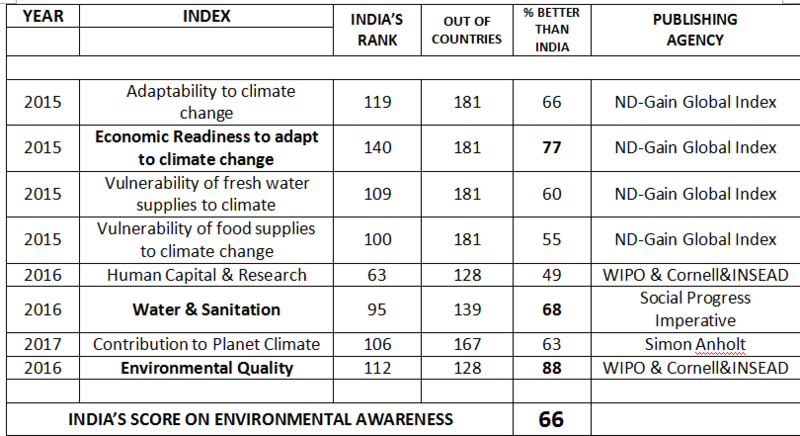 The table below shows that 70% of the countries have a better macro climate than India–a very disappointing number for the second most populated country in the world. Growth in GDP comes from either an increase in population or an increase in productivity per person. India is ranked 61st out of 75 countries in the Conference Board’s Productivity Index Eighty-one percent of the countries have higher productivity than India. Indian labor produces less than $3 per hour while workers in Norway produce almost $ 75 per hour. This suggests that India’s GDP growth might largely be the result of an increasing population and not productivity growth. India’s poor productivity reflects the government’s flawed obsession with increasing jobs as opposed to production. Most government departments are nothing more than employment agencies and have very poor productivity. The Indian Railways is the 8th largest employer in the world with over 1.4 million employees, followed by the Indian armed forces ( ranked # 9) with 1.3 million employees. Employment is a second order effect. If production increases employment will increase along with it. If increasing employment was the goal, then the government should just hire people to dig up ditches one day and fill them up the next. This would increase employment but not production. Education and skill training are critical to a country’s success. India ranks 168 out of 234 countries in its literacy rate. The country spends only about 3.3% of its GDP on education–Seventy-four percent of the countries spend a higher percent of their GDP on education than India. This is a crying shame for a country that boasts one of the oldest university in the world, The Nalanda University, founded in the 5th century. Eighty percent of the countries have better technological readiness than the citizens in India and seventy-three percent score higher on initiatives for youth development. In a country where about fifty percent of the population is under the age of 26, the demographic dividend could easily become a demographic nightmare if the country does not act soon to come up with a strategic plan to arm its young population with the skills required in today’s fast-paced technology-driven world. The Modi government should double expenditure on education in its next budget and appoint a respected educationist to run that Ministry. It is important to move beyond the economic numbers to measure things that matter to people’s lives. Is India providing its citizens with the basic and essential human needs like access to medical care, drinking water, etc.? Is Indian establishing the building blocks that allow citizens and communities to enhance and sustain the quality of their lives? Is India creating the conditions for all individuals to reach their full potential? Is India providing its citizens with the basic and essential human needs like access to medical care, drinking water, etc.? Is Indian establishing the building blocks that allow citizens and communities to enhance and sustain the quality of their lives? Is India creating the conditions for all individuals to reach their full potential? The table below gives the answer. India ranks in the bottom 17% and 21% respectively when it comes to quality of life ( score 83) and happiness (score 79) respectively. On the ability to provide its citizens with basic needs India scores a terrible 73–which means that 73% of the countries do a better job of providing basic human needs to their citizens than India. This is an astounding fact for a country that wishes to lay claim to a seat among the leading nations of the world. The terrible state of India’s social progress cuts across age and gender. It ranks in the bottom 40% on issues of gender inequality and in the bottom 26% of all countries when it comes to caring for its old. 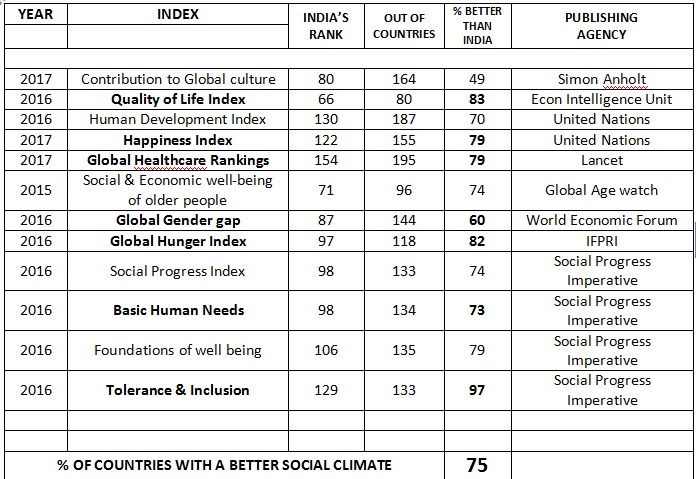 The overall score for India on the social progress attribute is a mind numbing 75. In other words, 75% of the countries in the world have done more to promote a better quality of life for its citizens than India. These numbers cannot be heartening for social liberals because after years of pushing for government solutions, large welfare programs, and subsidies India still ranks at the bottom in social progress. 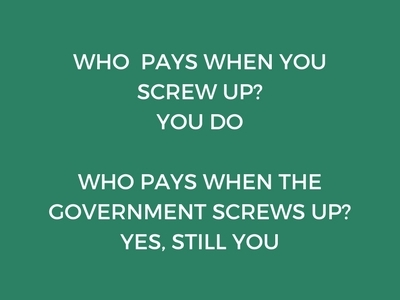 Decades of big, bureaucratic and corrupt governments have systematically destroyed this country over decades. Mystical programs of government help may warm the hearts of the gullible but all they do is put more power in the hands of the government machinery. In the name of taking care of the poor, politicians from all parties have looted the country blind. India’s youth now has increased awareness of the opportunities and lifestyle available to their contemporaries in other parts of the world. They have similar dreams which can only become reality with a dramatic increase in prosperity that comes only with limited governments and free markets. The other result that should send warning flags to Mr. Modi and his party are India’s score on tolerance and inclusion. It is at the very bottom (score of 97) on this attribute. The leaders of this country, in particular, PM Modi, must speak up against every instance of intolerance and exclusion. It is somewhat ironic that Mr. Modi wants to on the one hand modernize India with digital India and a cashless economy yet he supports the propagation of a medieval style of Hindutva that even the vast majority of Hindus oppose. India’s low score on this component should not surprise anyone given how dirty India is and how the country has managed to make cesspools of its rivers and water bodies. India’s major cities are environmental disasters, and air pollution levels in cities like Delhi on most days are a hundred times the acceptable norms. So, it is no wonder that eighty percent of the countries have a better environment than India. India is also very vulnerable to climate change and ranks 140th out of 181 countries in its economic readiness to adapt to climate change. If a climate-related disaster were to strike, India is thoroughly unprepared to save its assets ( water supplies, food sources etc) and its people. India’s future on the environment is at best murky. So, while India is a signatory to the Kyoto protocol on restricting emissions of Greenhouse Gases, there seems to be little focus on the environment at the policy level. At the heart of all human endeavor is liberty. The single most powerful force on earth is man’s desire to be free and independent. If history teaches us anything, it is that the best path to prosperity is the path of freedom. The human spirit thrives on liberty—letting individuals decide for themselves how best to achieve their dreams and aspirations. India ranks very poorly on the liberty component primarily because of a big and obtrusive government structure that has destroyed innovation and growth by robbing people of their economic freedom. India scores 67 for liberty and freedom which means that sixty-seven percent of the countries enjoy greater freedom and liberty than Indians. On the Human Freedom Index, India ranks 112nd out of 162 countries, on Economic Freedom 143rd out of 186 countries, and on personal rights 89th out of 128 countries. India is essentially an “ unfree” country. Sixty-seven percent of the countries have greater freedom of speech, and eighty percent of the countries have higher levels of personal safety than Indians. It is abundantly clear from the data that the Indian people have paid a huge price for big and obtrusive governments. The political elite and their crony capitalists have enriched themselves at the expense of the citizens. Can Mr. Modi change this? His administration has been scandal-free so far, but that does not in any way suggest that his government has not been overreaching and obtrusive. His Finance Minister is singularly obsessed with black money and has openly promised tax terrorism and suspension of some basic liberties. In fact, the government has proposed amending the Income Tax Act to allow tax officers to undertake searches and ‘ provisionally ’ seize personal and business assets without adequate reason. In another recent case, the government’s attorney general stated in the Supreme Court that people did not have absolute rights over their bodies–a stunning statement of the government’s position on individual rights. If Mr. Modi thinks that this will encourage innovation and entrepreneurship and induce people to ‘Make in India’ then he needs a serious rethink. His government’s obsession with black money at the cost of growth will be an extremely painful lesson for the people of India. Reducing black money will not suddenly turn India into El Dorado. Global indices that rank countries on critical attributes have now become a powerful tool to ensure better governance and limited government. Countries like Singapore and South Korea that have embraced the principles of free markets and unobtrusive governments have prospered and become some of the most livable countries in the world. India is the world’s largest democracy yet a vast number of its people live in poverty. Its streets are filthy, its cities polluted, and its rivers a travesty against nature. Productivity is a mere $3 per hour worked, economic freedom and individual rights are in the bottom thirtieth percentile, personal safety in the lowest twentieth percentile, and even the most basic human needs are unmet for a large percentage of the population. In one of the largest studies of its kind, I examine sixty-one different indices to better understand how India stacks up relative to other countries. India’s overall score of 64 clearly indicates that the country is headed in the wrong direction. Even after seventy years of independence, India ranks in the bottom thirty-three percent of the countries in freedom of speech. All the indicators of quality of life, happiness, and social progress show a country in urgent need of a new direction. How did we get here? The answer is very evident India’s biggest problem has been and still is its big obtrusive government that mires individual creativity, innovation, and personal growth with its voluminous, meaningless and often conflicting regulations and its stifling bureaucracy. And while the rest of the world is producing new, innovative and disruptive technologies, and training its people to meet the demands of the modern economy, India is still mired in the socialist policies of the past. Its political and bureaucratic elite still control all levers of power and reward themselves and their crony capitalist friends. While the world turns over new entrepreneurs almost every day, most of India’s business is still controlled by the same families who have been in control of large swaths of Indian business for decades. The rules still favor only a few. Those who know how to game the system live in riches while the rest of the country can’t even get its basic needs met. For all accounts, therefore, India is still an extractive economy in which a small group of people has the ability and power to exploit the rest of the people. The VIP culture is a classical example of such extractive institutes. There is only one way to change India: A complete change in mindset on the role and need for government in our lives.